San Francisco was buzzing with excitement with thousands of Social Studies educators this past November 17 – 19, 2017 at the annual National Council for the Social Studies conference. Representatives from the CLASP Outreach Committee were right there in the middle of the buzz engaging educators in conversations about teaching Latin America. 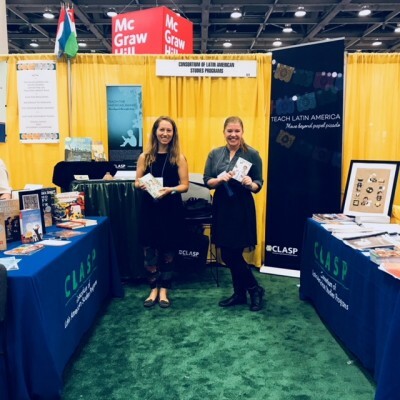 This year, CLASP once again sponsored an exhibit booth and distributed our CLASP tote bags filled with teaching resources from our centers along with special materials produced by Outreach Chair, Keira Philipp-Schnurer (CLASP Teaching Resources and Américas Award for Social Studies Flyer). CLASP was there representing resources on Latin America with many others in the International Alley of the NCSS exhibit hall. The NCSS reported a total of 3,404 teachers registered at this year’s conference held in the Moscone Center in downtown San Francisco. CLASP representatives engaged with about 200 – 300 of those educators. Sponsors of this year’s booth include Florida International University, Stanford University, Tulane University, the University of Chicago, the University of Florida, the University of New Mexico, the University of Pittsburgh, the University of Texas at Austin, the University of Utah, the University of Wisconsin-Milwaukee, and Vanderbilt University. Thanks to Stanford University’s Molly Aufdermauer and Elizabeth Saenz-Ackermann who helped to connect CLASP representatives in town and handle a bulk of the material load up. Also, we are very grateful for the help staffing the booth from Molly Aufdermauer, University of New Mexico’s Keira Philipp-Schnurer, Chair of the Outreach Committee, University of Pittsburgh’s Karen Goldman and Diana Shemenski, University of Texas’ Lindsey Engelman, and Vanderbilt’s Colleen McCoy. We are looking forward to next year’s conference in Chicago! CLASP sponsored former Américas Award committee member and associate professor of Reading & Language at National Louis University, Ruth Quiroa at the annual National Council for the Teachers of English conference (NCTE) in St. Louis, MO this past November. Quiroa presented on a panel with a presentation entitled Immigration in the Américas: Of Dividing Distances, Discrimination, and Dreamers. This conference among others (ILA, USBBY, the National Latino Children’s Literature Conference and many others) are excellent places to engage educators and librarians with Américas Award books. If you work with and/or present on the Américas Award at a national conference, please let Américas Award Co-coordinators Colleen McCoy, Vanderbilt University and Denise Woltering-Vargas, Tulane University know so we can share the information.